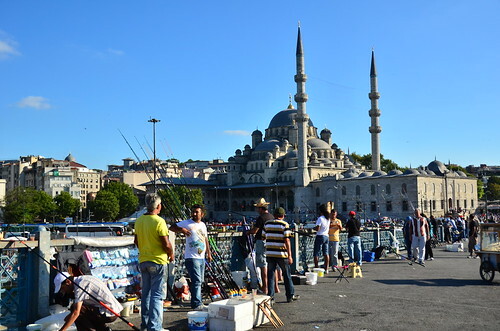 Istanbul – a city spanned across two continents and history dating back to the Byzantine – Ottoman Empire has interestingly bagged the title “World’s Hippest City” and also can be called as the Islamic city that knows how to party! 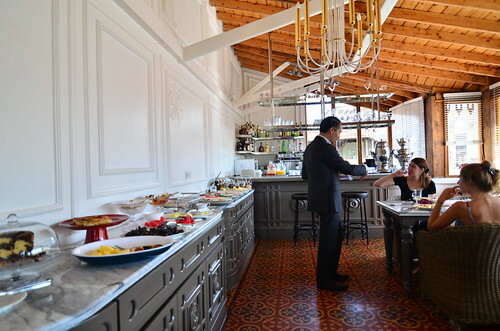 The House Hotel in the buzzling Galatasaray neighborhood amidst the extremely steep streets, is a charming four-story mansion built in the 1890’s. 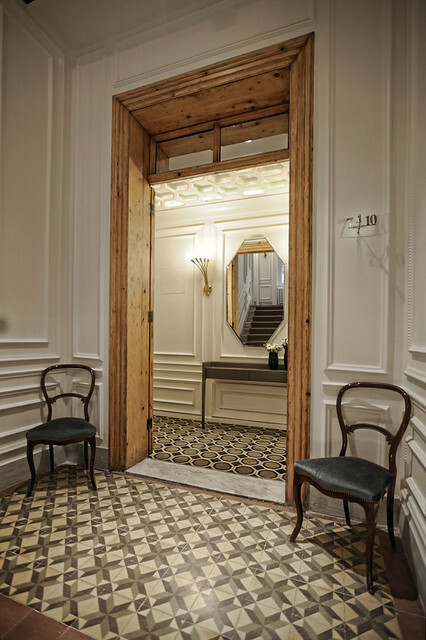 The original name of the building was “Appartement Zenovitch” and it has been entirely renovated in 2010 by Autoban. Autoban maintained the character of the house, by retaining all of its original glory; the wooden floors, mosaics, beams and the exteriors. 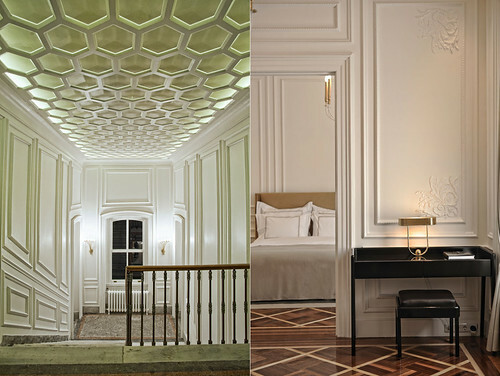 Hexagonal ceiling panels and custom made furniture seamlessly integrates a contemporary setting in this historical building. Walls with intricate work and the ornate chandelier surrounded by sleek devices (I really loved the white LED TV) with a neutral color scheme of whites, pale browns and gold is a total characteristic of an interior decor gem that anyone would love to sleep in! 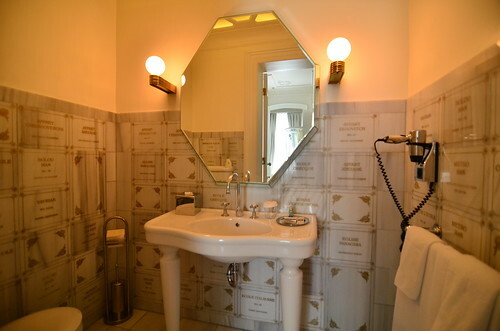 The inscriptions of the 18th century apartments names and schools in the bathroom is a clever inclusion of historic details. 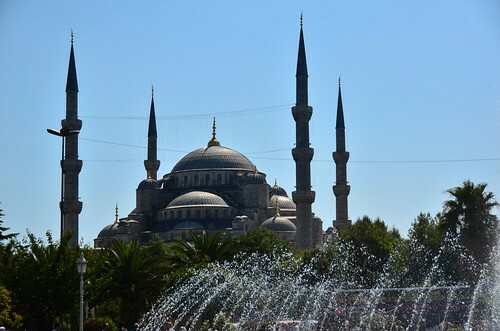 Sultanahmet is where all the tourists reside and naturally so, as the area is in over-abundance of important historic palaces and mosques. 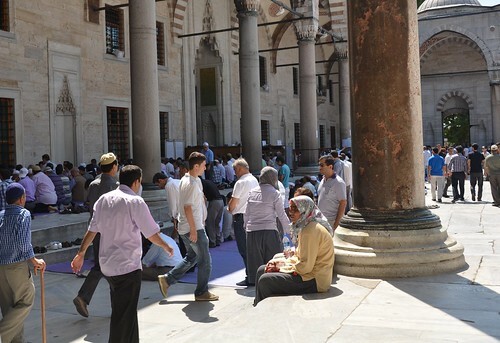 There is a mosque in any direction you look, some are huge, like this one with hordes of tourist buses and people waiting to join the mass, but when its prayer time, its bye-bye to the tourists. Tip: It’s a good idea to wear something that covers your arms and knees when visiting a mosque. 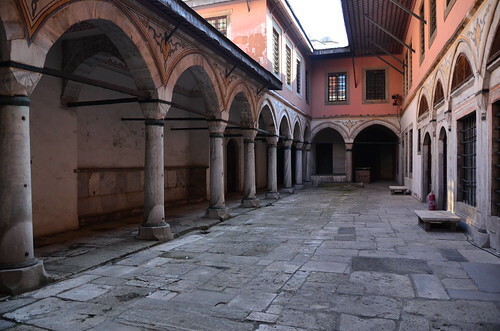 A church from the Byzantine empire converted to a mosque in the Ottoman Empire, probably the only mosque/church that has paintings of both the religions. 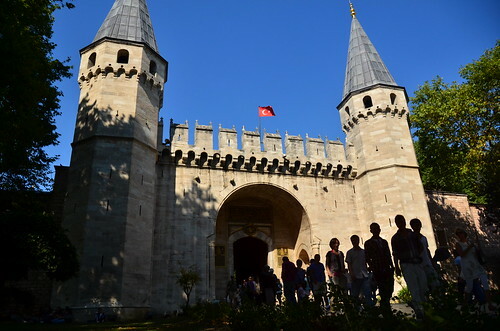 The Primary residence of the Ottoman Sultans built in the 14th century. 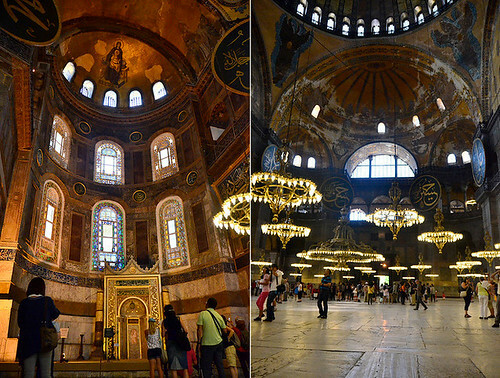 Its probably the best living site to breathe Ottoman art and architecture. 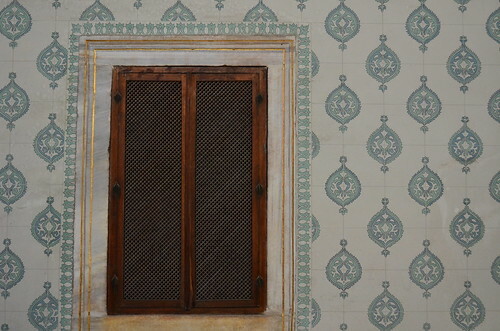 Visit the Harem section where the queen mother, emperor and his 500 concubines lived. 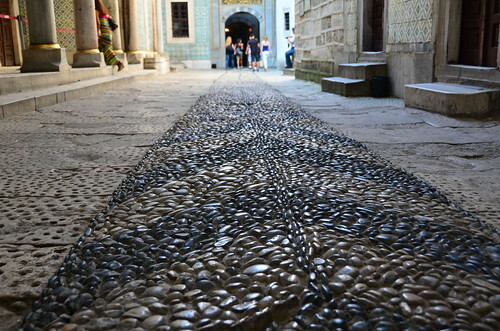 Ornate, colorful and extravagant details in these multiple buildings will easily take about 3-4 hours to walk the whole site and a good rest at the end with a good view across the Bosphorus. 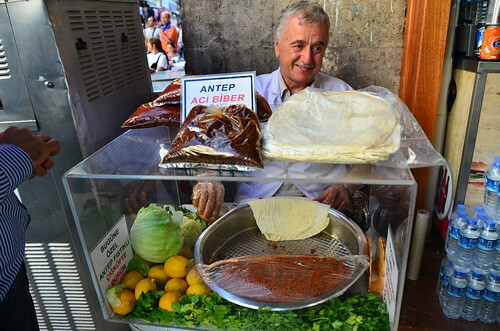 Cicek Biber, raw beef rolled in lettuce and bread. 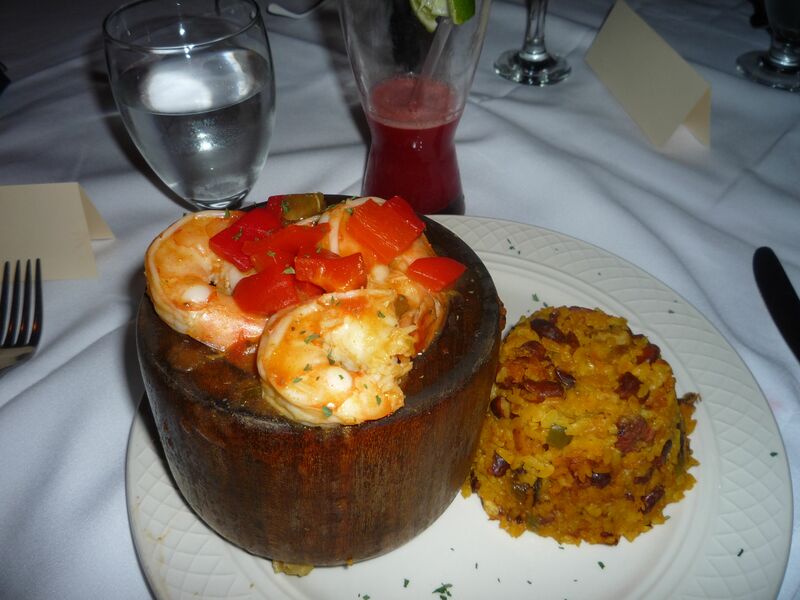 Spicy, crunchy and delicious! 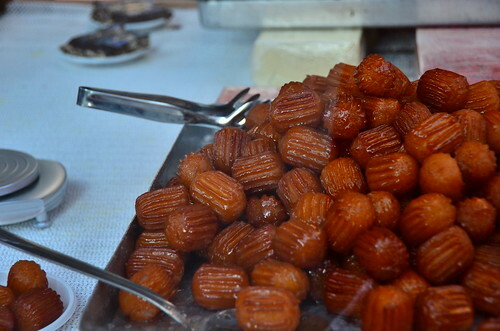 Do not miss this candied goodness found in most street corners. 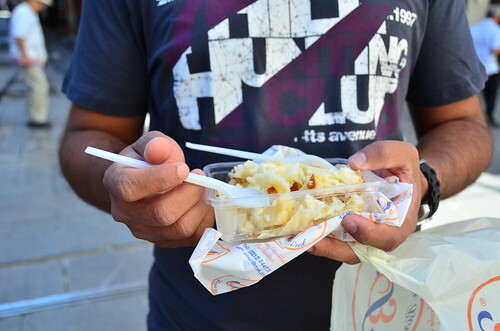 A breakfast staple, cripsy pasta with cheese. (apparently this is wildly popular in Eastern Europe). 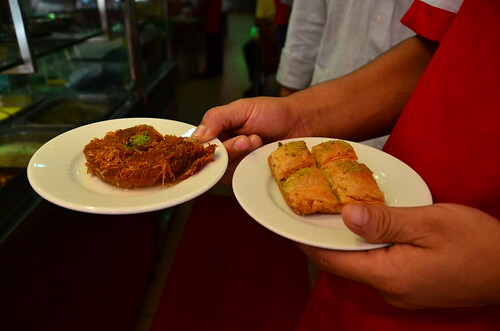 Forget that you have ever had a baklava until you taste this one! A mixed fruit, nutty, deliciouso dessert! 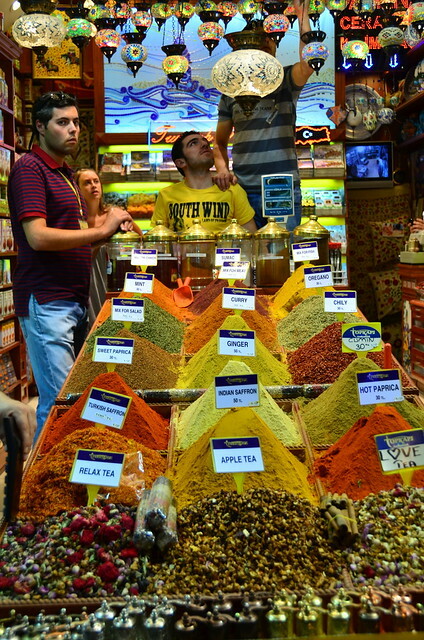 Grand Bazaar and Spice Souk are the two best markets for anything-under-the-sun. Boxes for your “expensive” gifts. Suree! 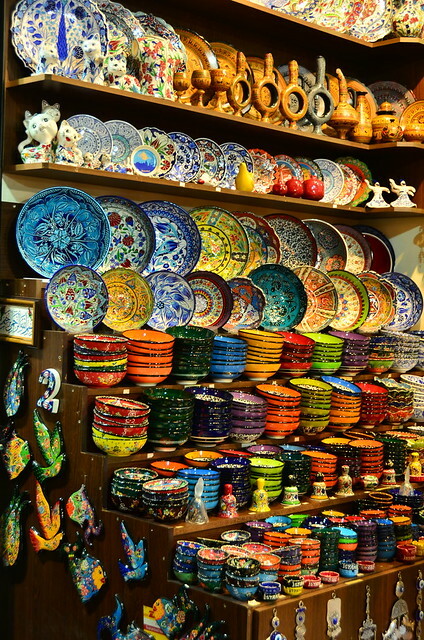 Shop for an assortment of Turkish teas or hand crafted ceramics that are displayed like colorful candies. Or how about the hazelnutty aphrodisiacs! Meyhanes are one of Turkish innovative concepts, its nothing but a tavern where the noisy, lively, nargile-smoking junta come together. Basically a place where locals come to chill, read newspaper, drink tea and while away their time. Its pretty with cushions lined on the road and the servers waiting on the other side to take your orders. 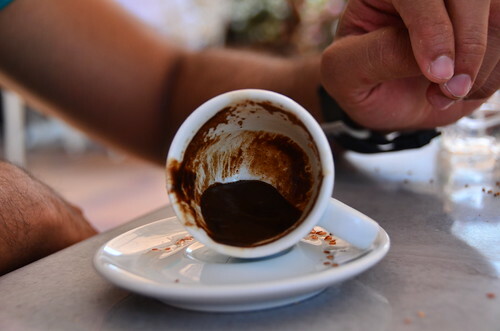 Turkish Coffee is another story, the thickest double shot espresso packed in one tiny cup. You are ready to take-off to moon right after this! 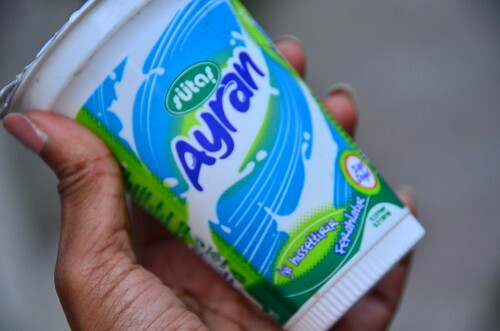 Another favorite drink apart from the teas was this yogurt based drink called Ayran! 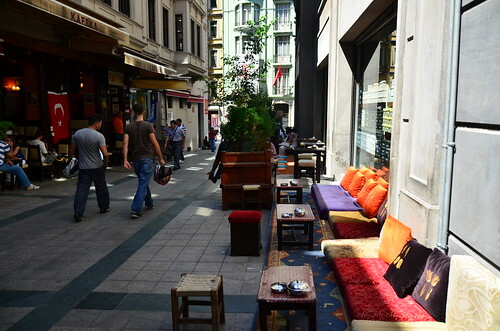 Istiklal Caddesi is the busiest shopping area with over a million people coming in the weekends, and the shops remain open til’ 1am and the restaurants later than that. Enjoy the tax free shopping and with bargain prices in some of their boutiques. 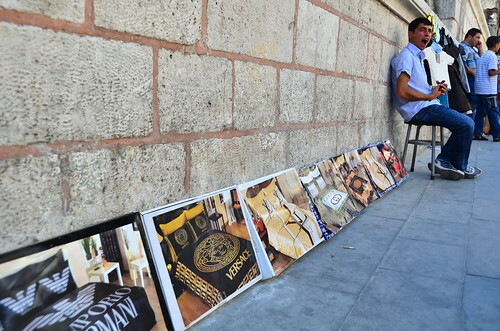 Nisantasi, is where you will find all the high-end stores, but I don’t have to go to Istanbul to buy Burberry or a LV. Oh wait, its tax-free here, so scratch what I said. 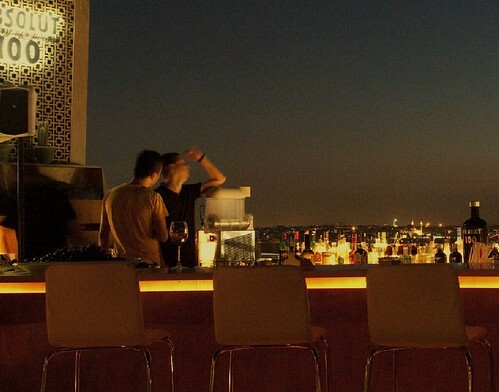 Rooftop bars are aplenty in this city, well its not a surprise since they are blessed with the best views with three waterways surrounding the city. 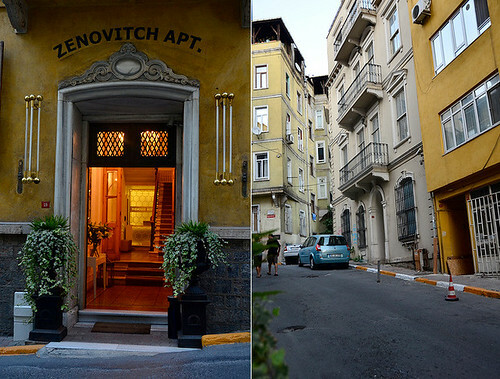 360 is set in a penthouse perched on a 19th century apartment building overlooking the old embassy row in Beyoglu. 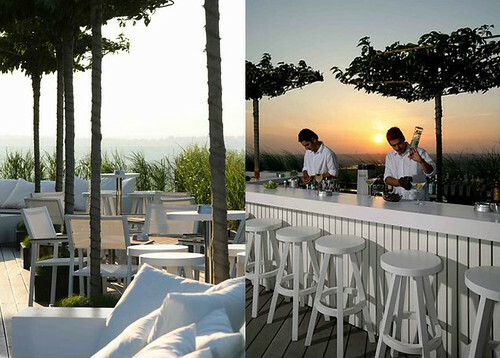 It commands a breathe taking view of Istanbul, but remember you are there for the view, the waitstaff take their own sweet time to give even a menu. 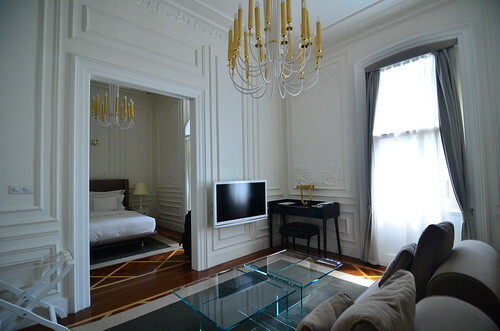 NUTERAS is located on the roof of the 200 year old historical building of “Passage de Petit Champs”. 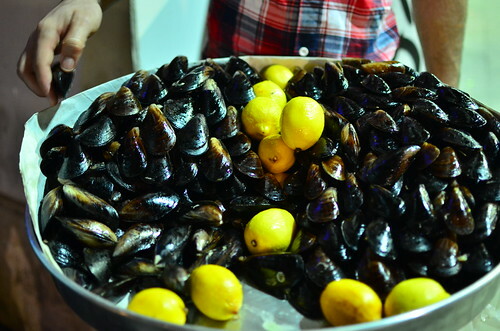 It has been one of the “it” places in town for dining and clubbing, with a view of the old city “Sultanahmet” as well as the view of famous “Golden Horn” makes it one of the best sunsets to watch at aperitif hour. 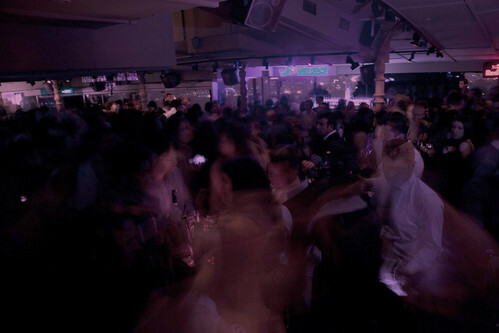 Clubs in Istanbul begins late, very late infact around 12 or 1am and goes until 4/5am. 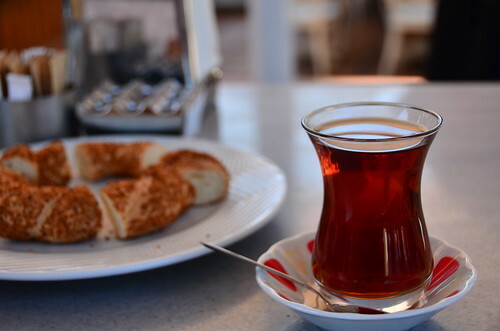 Time for a Turkish coffee to keep up with these guys! Indigo is famous for its light design and they are known for pumping electronic music and a young crowd. Also popular among the artist types and fashionistas! 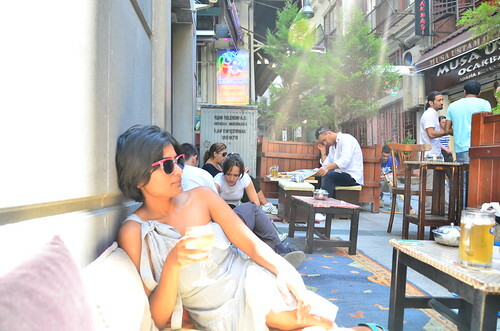 In order to get to this hip club you have to cross the Bosphorus to the Asian side. This oriental location includes a terrace, and a pool, with oil lamps, floor cushions and muslin drapes. 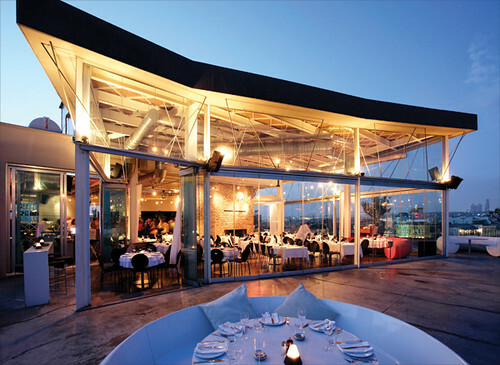 Enjoy a exotic time with an amazing view over the water while listening to a mixture of Western and Oriental beats. How would you like to see local art installations that goes side by side with heart pumping music in a church that’s 131 years old? The Hall is an open venue where anything that will blow-your-mind awesomeness goes. 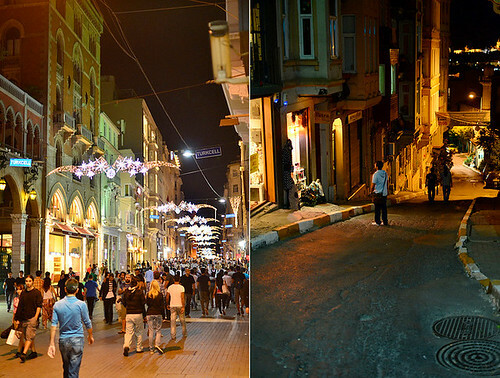 No wonder Istanbul is named as the “Place to be” and was awarded the “Cultural city of Europe”. Its multidimensional with a space for everyone, and there’s always going to be more to it than you can see in a visit.